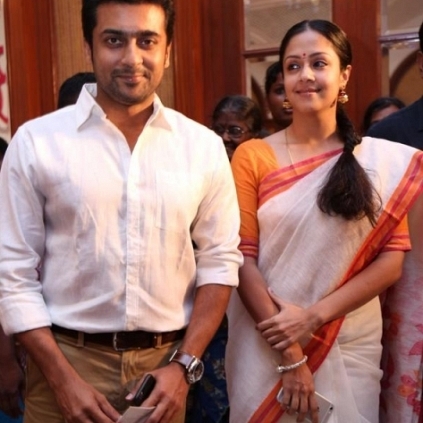 Here are 10 interesting moments from yesterday's (May 27) press interaction at 36 Vayadhinile's success meet attended by Suriya, Jyothika and the film's crew. "After the success of 36 Vayadhinile, now more people will approach me with scripts. I am ready to accept the good ones. But 36 Vayadhinile will be like the ultimate, I don't know if another film will happen like this" - Jyothika on acting in outside productions. "I suggested the title 36 Vayadhinile. A lot of people advised against it but I stuck on as it was very apt for the story." - Suriya on being the man who chose the title. "I would like to give her a salary, comparable to any top heroine. I am continuing to give her, as the moolah keeps coming in. She didn't take any money for acting in the film before the release." - Suriya on Jo's pay packet for the film. "No comparison. Each actor will interpret it in his or her own way and bring in a new dimension." - Rosshan Andrrews when asked to compare Manju Warrier and Jyothika. "We brought in a social interest angle with the organic farming idea." - Rosshan Andrrews on the relevance of organic farming to the film. "We live in an apartment. I am asking for permission from the apartment to set up a terrace farm at my home." - Suriya when asked whether he would set up a terrace farm. "Jo isn't tech savvy or gadget friendly. She is just now into email and stuff. I myself started using the social media only 6 months back. So am not responsible for her absence in Twitter and Facebook." - Suriya on Jo's absence from the social media. "Suriya in real life is an example of an ideal husband, while Rahman's character in reel is an example of a bad husband. That is 36 Vayadhinile." - Rosshan Andrrews summing up 36 Vayadhinile. "After marriage, husband and family become everything for a wife." - Jyothika. "She is a superlative actress than you." - Suriya's mother to Suriya after seeing the film. Suriya walks like a dinosaur for Pandiraj's Haiku ..
Will it be another ‘Thala’ Diwali this year?? Massu is a record breaker for Suriya!! Disappointment for Suriya fans in Tamil Nadu ? What if Vijay and Suriya do it for 'Thala 56' ? Vijay's 59th - A Cop story? What If Vijay And Suriya Release The First Look Poster Of Thala Ajith’s Next Film, Thala 56 ?? People looking for online information on 36 Vayadhinile, 36 Vayadhinile Success Meet, Jyothika, Suriya, Surya will find this news story useful.